2. Arbitrarily adjustable pressure switch: limitless section- to increase the elasticity of pressure and enlarge the difference of the pressure control range. 3. EVA human dynamic carrying cushion: is good for heat insulation comfortable and can decrease the carrying burden of the machine. 4. A new ventilation device: ventilative hole new trend-it is when the tank slopes, take place situation that liquid medicine overflows to prevent. 5. Various pump types are available: various pump types are available to meet the various requirements of the market. 1. Number: A0034. 2. Model: H-969. 3. Tank capacity: (H) 25 L. 4. Fuel tank capacity: 0.75L. 5. Engine: (1) Brand model: MITSUBSHI TL23. (2) Output / displacement: 1.2 HP / 22.6 c.c. (3) Carburetor: diaphragm type. (4) Fuel: mixture of gasoline and lubricating oil (ratio 25:1). 6. 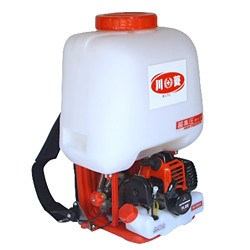 Pump: (1) Type: oil / strong /aluminum (select one from 8 kinds). (2) Code name: OSA. (3) Type: horizontal gear driving type. (4) Plunger: 1 piece (two-way operation). (5) Cylinder: 2 piece (aluminum). (6) Dia. of plunger: 18 mm. (7) Stroke: 7 mm. 7. Maximum pressure: 44 ~ 56 kg/cm². 8. Output volume: 9 ~ 11 L/min. 9. L x W x H: 43.6 x 35.5 x 63.5 cm. 10. Weight: 9.5 kg.